The SDS899 is a rugged rack-mount "(8) AUDIO INPUT - (4) AUDIO OUTPUT" Audio Matrix Hub suitable for both analog and digital audio applications. 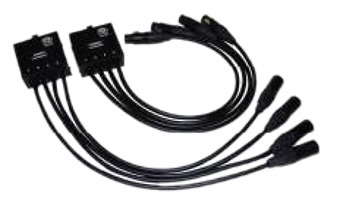 The 100% passive (for superior reliability) unit features a total of 16 slide switches, each pair of which controls an audio input on the UTP cable. The unit is compatible with the use of Cat5 cable in runs up to 1,000 feet in length, offering both lighter weight and lower costs. For Clear-Com™ users, the SDS899 offers total compatibility. 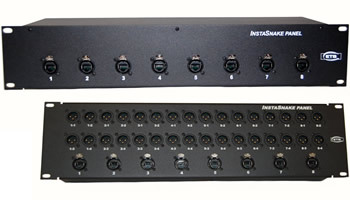 The ETS SDS886 is a 2-Channel "(1) IN - (4) OUT" Digital Audio Splitter Panel. This rack-mounted product has been designed and manufactured expressly for the digital audio market. Note: this device is intended only for balanced 110Ohm signals. The passive [and thus highly reliable] unit accommodates signal levels up to 10V. In addition, the versatile SDS886 maintains proper impedance so the remarkably innovative digital audio splitter need not be symmetrically applied. In many applications, the SDS886 completely eliminates the need for a distribution amplifier, not only significantly lowering costs, but reducing overall system complexity, as well. 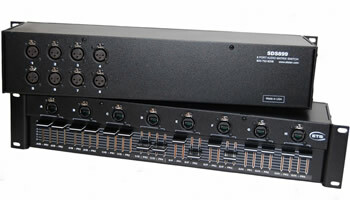 The ETS SDS887, a UTP Video Distribution Hub, designed for Broadway theaters and other similar theaters, has four baseband video signals transmitting through the distribution amplifier creating 32 outputs. The ETS SDS887 Hub can be used for monitoring in a variety of installations. Note: Unshielded Twisted Pair, Category5 or better cable should be used. The SDS887 Distribution Hub balances the input signal, distributes it on the UTP cable, and converts the signal back at each display. NTSC, PAL, SECAM, or CCTV signals are converted to and from the UTP cable using the ETS SDS888 Video + Power and SDS889 Quad Video Balun. For signal stability, EtherCon connectors are recommended for these products. Intended for theatrical applications where those backstage can monitor on-stage activity, the SDS887 Video Distribution Hub supports color video over a total run length in excess of 330 meters (1100ft.) inclusive of all cable segments, on Category 5 or better cable. Black and white signals are typically supported up to 750 meters (2500ft.). 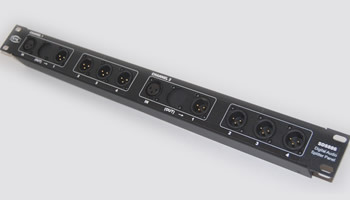 The ETS InstaSnake™ Series (SDS900 Series) is a compact, lightweight, versatile passive group of components allowing you to run audio signals over a single run of CAT5, 5E or 6 cables. With a roll of wire, these compact units are easily transported and/or stored solving dozens of live and/or recording sound problems. The InstaSnake™ is a passive unit, so you do not need power. The InstaSnake™ accepts 'mic' level, line level, analog or digital audio and supports phantom power when using shielded Cat5 or Cat6 cables. 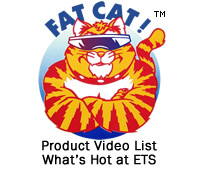 The ETS InstaMusician™ Baluns (SDS903 and SDS904) enable both audio and composite video signals to be sent over a single Cat5 or better cable. 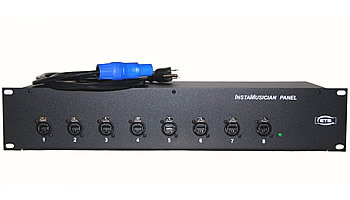 The InstaMusician Baluns are compact, lightweight, versatile, passive components that have bi-directional capability. Since the InstaMusician Baluns are passive units, you do not need power. The InstaMusician Baluns accept 'mic' level, line level, analog or digital audio and support phantom power when using shielded Cat5e or 6 cables. ETS has designed this custom part for theater orchestras for simultaneous listening and viewing. Hence, no more missed cues. Used in this application, the SDS903 and SDS904 are both highly cost effective and easily, neatly, and quickly installed. In addition, the single UTP cable replaces more costly and heavier coax cables. 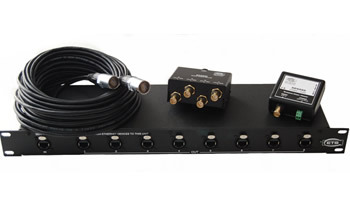 The SDS903 with (4) 3' pigtails lets you access the mixer without the need for an additional 3 microphone cables and RG6 or RG59 coax cable for video. 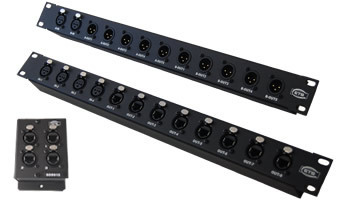 The ETS SDS Audio Splitter panels are 1 RU high featuring etherCon RJ45 to etherCon RJ45 jack, XLR to etherCon RJ45 jacks and XLR to XLR connectors. 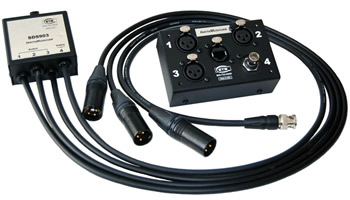 Each individually balanced audio input splits into several outputs and share on a single connection cable. It is suitable for analog and digital audio signals. Phantom power is supported when using shielded Cat5 or better cables. No external power source is needed which gives greater reliability. These panels can be used in conjunction with the ETS InstaSnake SDS901, SDS902 and the Audio Matrix Hub (SDS899) The Audio Splitter Panels offer a complete solution that optimizes nearly any professional audio installation. The SDS Audio Splitter Panels are cost-effective and quickly and easily installed. Many configurations are available to meet your connectivity requirements. run audio signals over UTP cables (Cat5e or better data cables). external power. These panels were designed to accept "mic"
power when using shielded UTP cables. tested to 850 feet over shielded UTP cables. Cat5 or better cable instead of costly coax and microphone cables. etherCon RJ45 jacks on the front.